Whether you’re preparing a Thanksgiving ham studded with pineapple and cherries or you’re tossing Hawaiian chicken pineapple kebabs on the grill for a casual backyard barbecue, one thing’s for certain: fresh pineapple is a year ‘round treat for the taste buds! Did you know that the pineapple was once a symbol of hospitality? If a pineapple was placed by the entrance to a Carib village, the Spaniards knew they were welcome. In Colonial North America, a fresh pineapple would be placed in the center of the table to welcome visitors for a festive meal. Health-wise, pineapple is known for its potential anti inflammatory and digestive benefits through a mixture of substances known as bromelain, which is extracted from the stem and core of the pineapple. According to laboratory research, bromelain might slow blood clotting and interfere with the growth of tumor cells. Pineapple is an excellent source of manganese and vitamin C, which is important for the healthy function of the immune system. 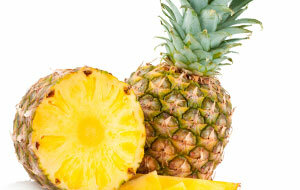 Pineapple also is a good source of copper, fiber, folate, and vitamins B1 and B6. Other fun and delicious culinary uses for pineapple include grilling pineapple rings to place atop juicy grilled hamburgers, topping pizza with pineapple, using the juice of pineapple for beverages, and adding pineapple to ice cream.